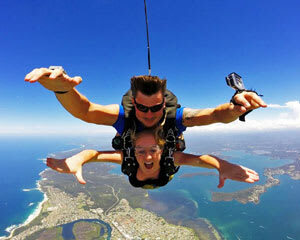 Skydiving is the ultimate Adrenalin rush! Experience the unparalleled thrill of free falling for up to 60 seconds at awesome speeds of approximately 200kph during a tandem skydive. As the excitement builds, your expert instructor will prepare you for the countdown and together you will make the ultimate jump from up to 15,000ft! Experience the unparalleled thrill of free-falling for up to 60 seconds at awesome speeds of approximately 200kph. The initial speed and sensation of free-falling make skydiving an adventure that cannot be matched. Once the instructor deploys the parachute, relax in the serenity of a peaceful canopy ride and take in the sensational aerial views of Newcastle and the lakes. Spectators are more than welcome! Awesome experience... what a rush The instructors were cool, calm and very experienced. Would recommend it to anyone. I had the best experience with you guys and I was amazed how good everything was the staff were amazing! Thought I was going to be really nervous but having watched 4 other groups of 4 landing safely on the ground, I had complete confidence I was in safe hands. I thought the video and photo package was a bit pricey. It was a wonderful experience for our son James the staff were very professional and he said he wld like to do it again asap.